What I got, though, was very different: a series of delicately-constructed lyrics that delighted me as they shattered the misconceptions the title had created. 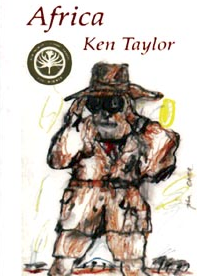 I decided immediately that this was a book I wanted to publish, and when I rang Ken to tell him, he invited me down to his property, Tanah Merah at Mt Macedon, to meet him. It was the beginning of a friendship that lasted until his death last week. Partly, this friendship was built on my appreciation of the book (which won the NSW Premier’s Prize in 2000), but partly also on his generosity and the richness of his life and life stories. On my first visit, as well as meeting Ken I also met Sarah, the woman who had inspired many of the poems in his new collection – the first he had written since At Valentines twenty-five years before (This book – At Valentines – has now been re-released as part of the Picaro Press Art Box Series). I had driven up from Melbourne to meet them and on that first trip I struggled to find the entrance to his five hectare property near the top of the mountain, but I can still remember my astonishment at the beauty of the place. It was dominated by a series of huge sweet acorn trees, there was a sculpture garden on one of the terraces, and rhododendrons, azaleas and Japanese maples were everywhere. The house and the nearby tower were of untreated timber. It had been rebuilt, Ken told me, after the bushfires of 1983 had destroyed the original dwelling, along with most of his archives. With them went his plans for writing a memoir of his years as at the ABC working as a film maker in the natural history department. Yet he did write, but never published, a wonderful account of the southern shores of Victoria, of filming trips to the bird-rich marshes around Port Phillip Bay, and of trips in fishing boats to the Bass Strait Islands. He worked on that book over a number of years, and I read several drafts of it, each richer and more impressive than the last. His failure to get a publisher interested in it was one of his continuing regrets. Another was his parting from Sarah; he had decided that the age difference was just too great, and that, to have a fulfilled life, she needed to marry and have children, which she later did. But I know how much he missed her, how he regretted his decision even though he always believed it had been the right thing to do. He was a man of great generosity and many enthusiasms. After the fire of ’83, he taught himself to paint, and the walls at Tanah Merah are covered with many of his beautiful watercolours – of the natural world and its creatures, as well as friends, especially Sarah. In his large studio there were dozens, probably hundreds more works, mostly water colours. He had friends all over the world – the poets A.A. Ammons ( a very influential figure in his own writing), Harold Stewart in Japan (whence Stewart had fled after the Ern Malley affair), friends he had made in France during his early days walking around Europe. He had worked with John Olsen on some of his natural history films, especially those in the outback and they had remained friends and as I mentioned earlier, John Olsen painted the cover image for Africa. Ken was a keen sailor. When I first met him, he had a trailor-sailor parked in his drive. He sold that later, but became a very keen member of the Albert Park Yacht Club, travelling down there most weekends; when he became too frail to manage by himself, there was always someone to take him out. One of his late ambitions was to buy a boat big enough to live on for considerable periods, but his health failed before that ambition could be achieved. He was an omnivorous reader. The fire of ‘83 had destroyed his original library, but when I met him in 1999, he was steadily acquiring a new one. Whenever I visited, he usually had two or three new books to show me. The second world war poet Keith Douglas was an especial favourite, as was Basho’s Journey to the Deep North (a title recently borrowed by Richard Flanagan). He loved the space and tranquility of Mt Macedon, but towards the end he found the winters there rather trying – cold and often foggy – so he tried to go north, or overseas, once the days began to close in. Beside his poetry, the thing I will remember most is his generosity. He loved friends to come and stay in the tower at Tanah Merah, a tall wooden structure that looked out over the acorn trees and a deep forested valley. He cooked in a kitchen cluttered with utensils, with books, with bottle of wine, with notebooks and sketches. While he was well we talked – and drank – late into the night. He had a rich fund of stories from his travels and his film-making and his painting trips that kept me entertained on our evenings together. On that day I met him for the first time, I had a good example of his kindness. I was heading north, home to Wollongong, when we parted. To make sure I didn’t get lost, as I followed them, he and Sarah drove the fairly complicated route to the nearest junction with the Hume Highway at Broadford, more than an hour away from Macedon. It was typical of the man, and part of the reason I so much valued his friendship. This entry was posted in Issue 11, Ken Taylor, Ron Pretty and tagged Australian Literature, Australian poetry, Obituary by Mark Roberts. Bookmark the permalink. I have just learned about Charles’s demise and am sad. I knew him whilst I was in Australia for a few years. Maybe we could mail about him privately as I would like to know a bit more? I would be grateful, thank you. I worked with Ken in the Natural History unit with him as film editor on many of his film.